President Hamid Karzai of Afghanistan has handed over extensive intelligence dossiers to Pakistan's President Pervez Musharraf detailing how suicide bombers who attack targets in Afghanistan are being recruited, trained and equipped in Pakistan. Although Mr Karzai stopped short of accusing Pakistan's military regime of perpetrating the attacks, he said the US and Britain would be "stepping up pressure on Islamabad" to take action to stop the attacks, as British troops soon deploy in southern Afghanistan. Mr Karzai was on a landmark three-day visit to the Pakistani capital Islamabad which ended yesterday. At least 30 suicide bomb attacks have killed nearly 100 people in Afghanistan, including civilians, over the past three months. 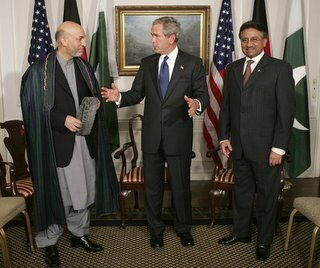 Mr Karzai faces extreme pressure at home where anti-Pakistan sentiment is rising. There have been dozens of demonstrations over allegations that Pakistan's Interservices Intelligence (ISI) is giving support to the Taliban. "We have provided President Musharraf with a lot of very detailed information on acts of terrorism being carried out in Afghanistan and we discussed in great detail what actions Pakistan could now take," Mr Karzai told The Daily Telegraph. "Americans are dying, a Canadian diplomat has been killed, our people are suffering, so it is time that action is taken to stop these acts of terrorism and interference in Afghanistan internal affairs. "After all this information has been given to the Pakistanis, we will see if the bombings will stop or not. We expect results, we expect that terrorist attacks will decrease," he added. Asked what he would do if the ISI failed to deliver and the perpetrators only went deeper into hiding, Mr Karzai said: "We will uncover them again. We have the abilities to do so and we will come again and again to talk and talk to President Musharraf." Mr Karzai also made it clear that the US and Britain had increased diplomatic pressure on Pakistan to stop any support to the Taliban. Britain is to deploy 4,000 troops in southern Afghanistan over the next few months, mostly to the province of Helmand, where the Taliban has recently stepped up its activities. "Britain now has a very special role to play. There will be thousands of British troops deployed in the south against the Taliban and neither Britain nor Afghanistan is in any mood to tolerate any more casualties," said Mr Karzai. "Britain will be piling on the pressure." The Afghan dossiers include the names and addresses of Pakistani recruiters, trainers and suppliers. 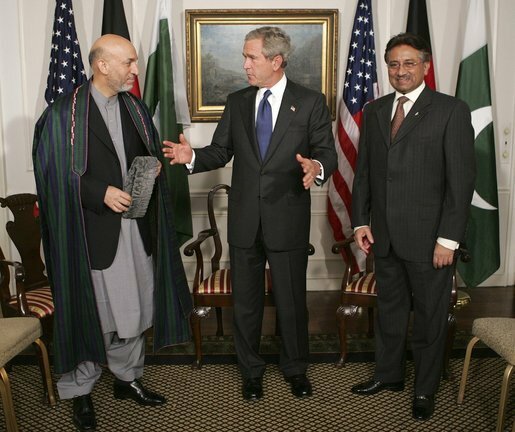 "In places like Karachi, Pakistani extremist groups working on behalf of the Taliban for a fee carry out the recruitment and then bring them to safe houses in Balochistan for training and equipping with the [suicide] vests," said a senior Afghan official who accompanied Mr Karzai. The official said that all the top Taliban commanders were known to be living in Pakistan with their families and the issue had been repeatedly raised with Pakistan. Pakistani officials no longer deny that Taliban activity is being co-ordinated from their soil, but they insist that the government has nothing to do with it. After his two-hour meeting with the Afghan leader on Wednesday night, Mr Musharraf called on "all the progressive political elements in Pakistan" to suppress elements who may be abetting the Taliban. Earlier Mr Musharraf - who usually is vehement in denying any kind of Pakistani involvement - told Mr Karzai that the onus of fighting terrorism "was on both the countries". He said: "Therefore it is incumbent on both Afghanistan and Pakistan, the governments, the intelligence agencies and the military of both sides, to jointly co-operate, co-ordinate and fight this evil." I hope they (pakistanis) pay equal attention to the jehadis focussed on India. There was an explosion in (Ahemdabad) Gujrat. I am hoping police (yet again) doesnt find the hand of ISI/PoK based terror groups behind it.